On a rainy day it was tempting to visit the first (indoor) Christmas market this season in Pyrenees Orientales in South of France. 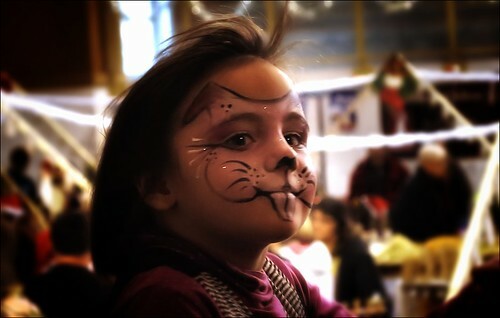 Amongst all the activities going on we found this little girl very serious about her face painting that made her appear this way. The event took place in the small village Vinca - by the foot of the high mountain Canigou (alt. 2800m) - also said to be the holy mountain of the Catalans.